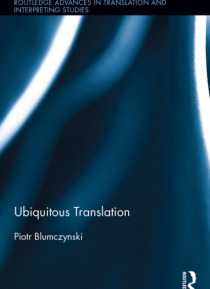 In this book, Piotr Blumczynski explores the central role of translation as a key epistemological concept as well as a hermeneutic, ethical, linguistic and interpersonal practice. His argument is three-fold: (1) that translation provides a basis for genuine, exciting, serious, innovative and meaningful exchange between various areas of the humanities through both a concept (the WHAT) and a method … (the HOW); (2) that, in doing so, it questions and challenges many of the traditional boundaries and offers a transdisciplinary epistemological paradigm, leading to a new understanding of quality, and thus also meaning, truth, and knowledge; and (3) that translational phenomena are studied by a broad range of disciplines in the humanities (including philosophy, theology, linguistics, and anthropology) using various, often seemingly unrelated concepts which nevertheless display a considerable degree of qualitative proximity. The common thread running through all these convictions and binding them together is the insistence that translational phenomena are ubiquitous. Because of its unconventional and innovative approach, this book will be of interest to translation studies scholars looking to situate their research within a broader transdisciplinary model, as well as to students of translation programs and practicing translators who seek a fuller understanding of why and how translation matters.